Meteor House » Announcing The Song of Kwasin in Its First-Ever Standalone Edition! 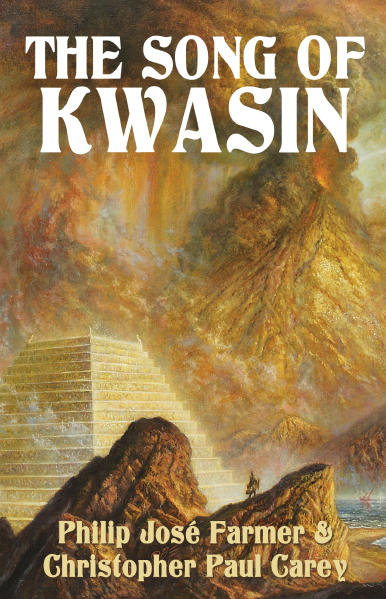 Announcing The Song of Kwasin in Its First-Ever Standalone Edition! In a very proud moment for Meteor House, we also debuted the never-before-published Restored Edition of Philip José Farmer’s Flight to Opar, the second volume of the Khokarsa series. This new edition features more than 4,000 words of text that were cut from Farmer’s original manuscript, plus a host of bonus materials. The trade paperback edition of Flight to Opar is in stock, and we still have a few copies remaining of the Limited Edition Hardcover signed by the book’s editor, Christopher Paul Carey, though we don’t expect these to last very long. Now, hot on the heels of those exciting Khokarsa releases comes Meteor House’s new edition of The Song of Kwasin by Philip José Farmer and Christopher Paul Carey! The sequel to Hadon of Ancient Opar and Flight to Opar, The Song of Kwasin has previously been available only in an expensive hardcover omnibus, and has never before been published in its own standalone edition. Not only that, but Meteor House’s new edition is packed with both rare and unpublished bonus materials, making this the definitive edition of the novel (available as both a collectible hardcover signed by Christopher Paul Carey and an affordable trade paperback). If your Farmer collection includes only the old DAW Books mass market editions of Hadon of Ancient Opar and Flight to Opar published back in the 1970s, or the more recent editions of those two books, then you’re going to want this new edition of The Song of Kwasin, because the novel is the culmination of the original Khokarsa trilogy. To say any more would be telling, but believe us when we say you’re not going to want to miss it! After years of exile in the Wild Lands, the giant warrior Kwasin of Dythbeth returns to the mighty Khokarsan Empire seeking the oracle’s forgiveness, only to find his native land torn asunder in a bloody civil war. The tyrannical King Minruth has usurped the throne from his daughter Awineth and, allied with the priests of the sun god Resu, overturned the beneficent, centuries-old rule of the priestesses of the goddess Kho. His spoiled cousin Hadon having fled with his companions to far-flung Opar, Kwasin soon finds he will have to take up the cause alone against Minruth the Mad. Wielding his massive Ax of Victory, forged from the heart of a fallen star, Kwasin sets out to reconquer the throne of Khokarsa. But when he finds himself caught between a vengeful queen who seeks to control him and a conspiring priest who wants him dead, Kwasin must decide between reining in his unruly passions or unleashing them in a fury that could hurl the empire into oblivion. For the high priestess has decreed that unless Kwasin can master his wild nature and stop King Minruth before he attains immortality in an unholy ritual of the sun god, Great Kho will destroy all the land! The Song of Kwasin is due out in December. Our Signed Limited Edition hardcovers sell out fast, so click here to preorder your copy now! Comments Off on Announcing The Song of Kwasin in Its First-Ever Standalone Edition!